For a business to really be successful, working capital is pretty much a necessity. It’s able to free up a lot of different things so that a company can have success and thrive financially. 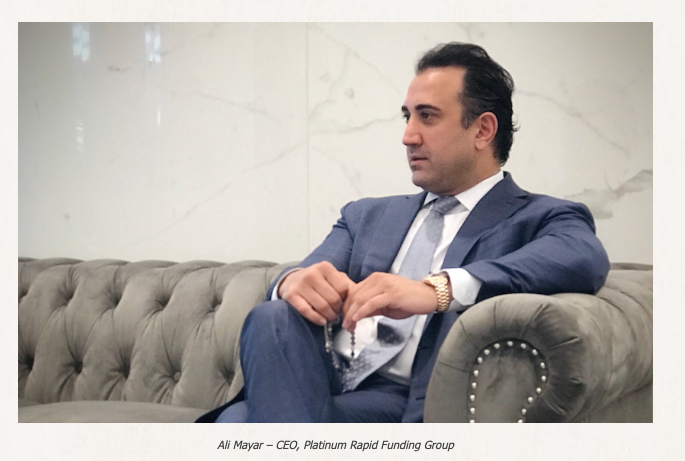 Nobody understands that better than the CEO of Platinum Rapid Funding Group, Ali Habib Mayar. He has been doing what he can to help out businesses of all sizes get the money they need. So how exactly does his company work? Also, what insights can he give us? Here, is what he had to say after doing a brief interview with us the other day. What would you say sets Platinum Rapid Funding Group apart from all the other options out there? Business owners all over America are always looking for working capital. Generally, that process needs to be done quickly in the event. With that in mind, we do all we can to provide a service that is quicker than any other out there without sacrificing providing a stellar customer service experience. We do whatever possible to make sure that customers are impressed with all we can provide. Do people fear doing business online or over the phone? It is something that we have been addressing for quite some time. People are getting more and more comfortable doing business online or by phone, but sometimes it takes a little bit of convincing. Our growing track record has really helped us stand out amongst the competition, but the reality is that for many of the clients we serve the experience is performed digitally, or by phone. Can bigger businesses get the funds they need from you? We specialize in working with small and medium businesses but depending on how you qualify or what your business situation is, large businesses can benefit from working with us as well. We are a company that offers over $1 million for some businesses if they qualify. It really comes down to what the business needs at that moment in time. What if a business needs additional funds later on? Applicants can apply multiple times if they wish. There is really no limit in that respect. A business can be hard to figure out as far as finances are concerned, and some people would like to see how they can benefit from a smaller amount first. It actually works in everyone’s favor, because business owners can get a feel of how the process works and we can get a feel for how that business owner operates their business. In turn, it’s a win-win for everyone and the start of a true partnership in business. Finally, for those who might still be curious about obtaining working capital, can you walk us through what a first-time business owner should expect? The first step would be to go to our website and apply at PlatinumRapidFunding.com. The application process is fairly simple, and people will hear back from our company quickly.